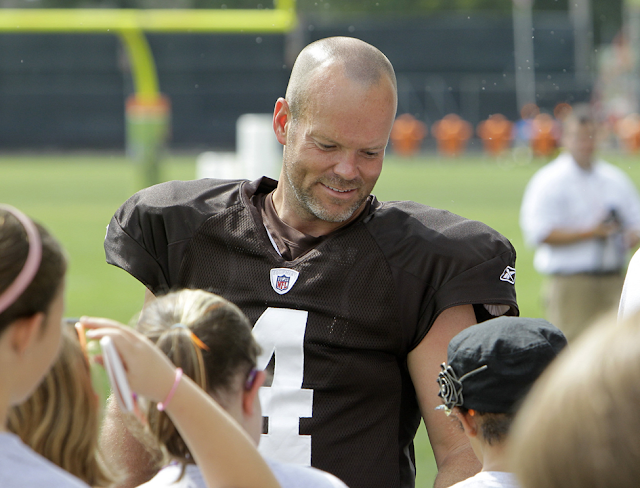 Phil Dawson has to be a freak of nature, or he’s simply extremely talented. In his first 12 seasons in the league, he made 10 field goals of 50 yards or longer. Last season alone he made seven. Last week in Green Bay he made two longer than 50 and another of 47. Since 1999, the guy has been the ultimate professional, and if the Browns retired numbers his number “4” would belong right next to Lou Groza’s. He’s suffered through losing seasons, finished a game kicking off and making field goals and extra points with a broken arm and made just about every key kick asked of him -- including the one off “the Dawson bar” in Baltimore. The only time he misses is when a snap goes awry, or something else bizarre happens -- like when a 2002 overtime kick in Pittsburgh hit the helmet of Kimo Von Oelhoffen. He’s never ducked a question, and always talked about supporting the team. And he’s done it while being a devoted father and husband to his three children and wife Shannon. In the list of pro’s pros in Cleveland, Dawson belongs at the top. This week, Dawson sat down with Pat McManamon and discussed his successes, his approach, the nuances of kicking and his career. They equate to a manual for any young player about what it means to be a pro, and by extension what it means to be a Cleveland Brown. Question: What is up with you making all these 50-yard field goals? Are you getting stronger as you get older? Answer: I think a lot of it is perception. I was always known growing up as a guy with a big leg. For whatever reason when I got to the NFL, my label was the opposite. I think sometimes in this league when you’re good at one thing people automatically assume you’re not at another. So if you’re an accurate field goal guy, you must not be a strong field goal guy. Or conversely if you’re a big-leg field goal guy you must not be very accurate. That’s just kind of how it goes. There’s some of that. But another is opportunity. A lot of years I didn’t even try a 50-yarder. That means I didn’t make one and when you don’t make one now you get a labeled as a guy who can’t make one. And then the third thing is I’ve worked my tail off, so I have gotten stronger. Is that not why we go in the weight room in the offseason? Is that not why we do the flexibility training and all that kind of thing? So … opportunity, have gotten stronger, and just the confidence now when I go out to try one of these. In the case of the other night (in Green Bay), I had just been out there five minutes earlier. You make one now you feel like you can make another. Q. You had as many 50-yarders last year as you had the first nine years. Is that simply a matter of trying? I remember Chris Palmer used to punt from the 30. A. It was a special year when things came together. But in a 10-game season my senior year at high school I had four 50-yarders. I’ve been doing this a long time. Q. How about at Texas? A. I had like 13. I was kind of known for making the long field goal. I mean I’m very appreciative of the opportunities, and I have gotten stronger and more confident and all that stuff, but I’m not necessarily doing anything that’s surprising me. Q. What do you do specifically in training to help? A. A typical day for me in the offseason is in the weight room for two, two and a half hours. Then I’m on the field doing all my on-the-field kind of stuff. The older I’ve been getting I’ve been getting into flexibility. Q. Yoga? Any of that kind of stuff? A. Yoga. Pilates. Massage. All that kind of thing. If it were just strength, Ahtyba Rubin would be our kicker. It’s a combination of strength and flexibility. Q. Is it a workout tailored for you or did you come up with it? A. There’s a place called the HIT Center of Austin - High Intensity Training Center of Austin. Those guys really helped me out this past offseason. I’m really excited about where my body’s at right now. Q. I apologize if this is not appropriate, but the general rule says that as guys age they are not supposed to get stronger. A. Like I said, I don’t know that I’m that much stronger than I’ve ever been. I just feel better and I’m more confident. And I’m able to display the strength that I have better with all the flexibility and all that kind of thing. And if we’re saying stronger, then that’s assuming we were weaker. It’s all back to opportunity. Q. Did you find that yoga helps your frame of mind too? A. (Dawson leans back and smiles.) I can’t stand that part of it. A. I just want to stretch. Let’s make my hamstrings feel loose. That’s what I want. Q. I was trying to think, and obviously there have been a lot of losses so there weren’t a ton of opportunities, but I could not remember a time when you were asked to make a game-winning or game-tying kick when you missed it? A. Well, St. Louis last year. Q. Well those were weird circumstances (when the snap went awry after hitting the guard’s leg). Q. How long longer do you want to keep doing this? Multiple years. I feel great. Q. You have a number? Five? A. I’ll tell ya … I don’t know the exact number, but I’m not going to be a guy that keeps playing and tries to eke out years. I want to perform at a high level. I want to try to be the best there is in the league. And I want to be central to what my team is trying to accomplish. And if that’s not the case, I’ll be gone. Q. Have you looked at any guys’ careers and said, ‘He’s done it into his late 30s’? A. I’m aware of what guys have done, but I think I’ve kind of traveled a different path. I’m still in the North. I’m still kicking off. I’m still kind of the blue-collar path. A. Yeah. A lot of these guys that have hung on have maybe put in their time in a Northern climate and they make their way down South or they get in a dome or maybe they give up kickoff duties and that kind of thing. I have no desire to have my role diminished at this point. I love the challenge of kicking in bad weather. Q. You do? Seriously? There isn’t part of you that would want to kick in better conditions? Q. That’s another thing to me that’s impression. Your touchbacks are up there with anyone’s in the league. Until the weather gets cold, but that’s going to happen to everybody. A. When we went to Indianapolis last year, I had three touchbacks in the game. I’m thinking if I had eight games in the dome … Another whole thing is opportunities to kick off. We don’t score as much. Of course my touchbacks are going to be less. Q. Is there any part of you that would like to focus just on field goals? A. I love the whole thing. The challenge of preparing for an opponent. Using different kicks to attack whatever scheme it is they are coming at us with. That’s usually a high intensity point in the game. I love feeling that. Q. When you say you’re limited in Cleveland to what you can do on kickoffs, how so? A. With traditional winds, you have to go one way or the other in terms of direction. Not many people are hitting touchbacks. Maybe early in the year in our stadium. By October, not many people are banging touchbacks. So instead of just hauling off and kicking it, you’re placing it, hanging it, making it go this way or that way, that kind of stuff. Q. I think back to certain games in your career. The one in your rookie year at Pittsburgh to beat them. When you kept kicking with a broken arm. You didn’t ask out, and it must have hurt like blazes. Q. And the other was the long one in the snow against Buffalo when we all thought Romeo (Crennel) was nuts to have you try it and you made it. Any others jump out? Q. That’s the night of the famous Phil Savage e-mail. Q. See what you caused? Q. Do you feel appreciated in Cleveland? A. Absolutely. There is a tangible feeling I have when I come into our stadium. The fans, the security guards at the door of the locker room, the policemen who patrol the hallways, the ticket attendants. Whoever I see down there it’s pretty fun, pretty neat. And going around town, bumping into people. Yeah, I think I am appreciated by them. Q. You probably don’t want to hear this because you have multiple years left, but if the Browns ever retire numbers yours should be next to Lou Groza’s, in my mind. A. That’s an argument I’ll let everyone else make. To even be considered is an honor given the amount of respect I have for him and what he did for this place. Q. Know the number of points you need to catch him? A. Not exactly. I think it’s like 190 something. Q. A year and a half? A. Well, two years. If we’re lucky. Q. Do you set goals every year? A. Yep. I keep most of them to myself. I’m trying to be the best. Still some personal goals I’d like to accomplish. I’d like to win some games. I would gladly sacrifice a couple missed kicks to have an opportunity to make some in game-winning situations. That’s where I am with my career. As long as I’m playing I’ll try to be the best there is, and the day that’s no longer there it’s time to hang it up. Q. The argument could be made that you are among the best, but because the team has lost it’s not noticed. Is that frustrating at all? A. Yeah. It’s frustrating. Not for ego. It’s what drives me, to be quite honest. I came into the league undrafted. I joke with (special teams coach Chris) Tabor that I’m going to have this chip on my shoulder surgically removed the day I retire. But I’ve learned to use criticism and doubt for being overlooked as fuel. But I’ve also had to learn in some respects that shouldn’t be the result of all your efforts. To get the pat on the back, to get the recognition. There needs to be a certain amount of satisfaction in knowing what your job is, coming out here and doing your job. I think those are gonna be the things that I remember and enjoy the most when I’m done. Things that a lot of people don’t realize. Knowing how difficult a 33-yarder was on a certain day when maybe my back was tight and I wasn’t feeling good. Being able to still make it. Rising to the challenge. Those are the things I take satisfaction in. If the day ever comes when I get recognized for what I’ve done here, great. But if it doesn’t, that’s enough. Q. Do you feel like your peers recognize you? A. I do, and that means a lot. Knowing so many coaches around the league now, players. It’s fully rewarding to hear what they have to say. Q. Last question, of all the guys you’ve encountered here, who taught you the most about being a pro? A. Chris Gardocki. I wouldn’t be here without Chris. Some of it was spoken word, but most of it was just watching the way he approached things. Some of my game day quirks to this day, that people are like ‘what in the world are you doing?’ … I learned from Chris Gardocki. A. Oh good grief. I take that sticky spray that the trainers use to do tape, and I spray it before I pull my socks on because it holds your socks nice and tight. Who would have ever thought to do that? But I watched Chris do it so then I did it. That’s kind of a stupid one, but there’s some more important ones that I do. Just the way he knew his opponent. The way he studied the weather. The way he was intense even out here on each and every kick. We get a label as kind of screwing around, but when it was time to do his thing he did his thing. He played 17 years, never had a punt blocked, was an All-Pro twice. There you go. I’m on year 15, haven’t gotten to the Pro Bowl yet but I’m going to keep focusing on each and every kick, and hopefully now Reggie (Hodges) and Christian (Yount) and the guys that are in my little group, we’ll have our fun, but they’ll see when it’s time to go to work there’s no messing around and everything is important. That’s what I learned from Chris. Q. I lied about that being the last question. The contract situation (for the second year in a row Dawson is playing under the franchise tender, without a long-term deal) doesn’t seem to bother you when you’re playing. A. Not now. Offseason it’s tough, because you’re not out here doing anything constructive with it. Q. But you’ve also proven you can work in the offseason on your own. A. Yeah. Like I said. I’m going to approach every season the same way. Every year has its distractions, and this year my contract situation is a distraction. I just have to deal with that and do what I can. Q. You probably don’t remember, but back when Butch Davis was coach and Earl Little complained about not being able to go out to dinner on the road, I asked you about it and you said the only thing you wanted to change was winning. You said you’d practice naked if it meant more wins. That’s not a real pretty image. A. (Laughs) No, it’s not. But that’s what it’s about. Q. How are the kids, the family? A. Great. That’s the hardest part. We moved to Austin because we didn’t know with the contract, and now they’re in school. They come up for home games, but it’s brutal not being around them. But they are doing great.